The Formula One teams would have found 2001 harder to prepare for than the previous season, due to major changes in the FIA's technical regulations governing aerodynamics (See the Technical Preview). These aerodynamic changes should allow Formula One cars to race closer together and make overtaking easier. Ironically, improvements in tyre technology may have already counteracted these aerodynamic changes on some circuits, judging by the number of lap records broken during winter testing. The 2001 season is also the opening round of a new F1 tyre war. Bridgestone have improved the performance of their grooved Potenza Radials, which should give them a big advantage over Michelin at the start of the season. During winter testing, in dry conditions, Bridgestone tyres have consistently been faster than the Michelins, but in a few wet sessions, Michelin seems to have had the upper hand. Other back-door changes saw a complete overhauls of the management of Jaguar and Benetton-Renault; Minardi was bought by Australian 'White Knight' Paul Stoddart; Jordan's Technical Director, Mike Gascoyne, was poached by Benetton; Eghbal Hamidy left Arrows to take Gascoyne's position at Jordan, while ex-Ferrari aerodynamicist Nicolo Petrucci has been recruited by Arrows to replace Hamidy as Chief Designer; McLaren's Steve Nichols and Henri Durand have moved to Technical Directorships at Jaguar and Prost respectively; and, in contrast, Ferrari and BMW-Williams have more-or-less maintained their status quo. So what will the pitlane look like at Albert Park? And how will the teams fare in the next 17 races? Team Principal: Jean Todt; Technical Director: Ross Brawn; Chief Designer: Rory Byrne. Chassis: Ferrari F2001; Engine: Ferrari 050; Tyres: Bridgestone. 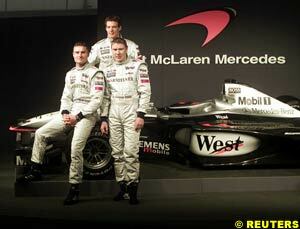 Goal for the 2001 season: To retain the World Drivers' title and the Constructors' Cup in 2001. Modifications for 2001: Sporting director Jean Todt rcently said that, "The F2001 has a new engine - the 050 - which is an evolution of the 049, and we have tried to improve the car in all areas - chassis and engine - in line with the new FIA regulations." Chief designer, Rory Byrne, expanded on this, commenting: "The aerodynamics have been optimised according to the new rules for 2001, since the changes this year are more significant than those of 1998. There have been developments in all areas, but especially in the front wing. The new engine has been completely re-designed, as well as the front and rear suspensions in order to maximise the use of the Bridgestone tyres." Greatest Assets: Ferrari are starting this season from a position of strength, dominating the end of the 2000 season. Ferrari have great resources and have a history of reliability over the past few seasons. Ferrari's trump card is race strategy, with their pitstops normally being of the highest standard. 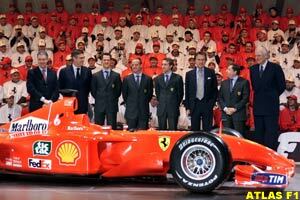 Achilles heel: intra-drivers 'politics' has sometimes got in the way of success for the Scuderia. Team Principal: Ron Dennis; Technical Director: Adrian Newey; Chief Designer: Neil Oatley. Chassis: McLaren MP4/16; Engine: Ilmor-Mercedes-Benz F0110K V10; Tyres: Bridgestone. 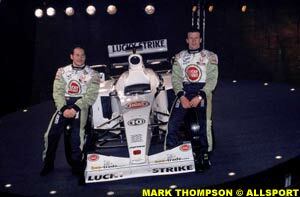 Goal for the 2001 season: To regain the World Drivers' title and the Constructors' Cup in 2001. Team Principal Ron Dennis stated, "Our motivation is there, if anything it is deeper than ever and we will be going a lot greyer." Dennis added: "Every year you have to dig deep because it gets tougher year by year. The regulation changes this year gives us more work but we know we are going in the right direction. We are looking forward not backwards and we are ready for the challenge." Modifications for 2001: Technical Director, Adrian Newey stated that, "The MP4-16 is not evolutionary but a totally new car for the new rules. The main one of which is the change to the front wing regulations and this has had quite a knock-on effect on the configuration of the remainder of the car. The 50 mm [of increased height] might not seem a great deal, but it has had a great impact on the design of the car." Newey added: "We've raised the nose by about 5 cm to go with the raised wing. That affects the chassis shape, and the chassis is also slightly bigger due to the regulation change. So the front is quite a bit different to the old car. Then we get to the rear wing changes, which again have affected things a little bit, so we've changed the rear suspension to try to suit the rear wing changes." Greatest Assets: Great resources, experience and a long track record of success. Achilles heel: Reliability might be a problem. Pit-stop strategies have sometimes been a weakness. McLaren have responded to this challenge by promoting Pat Fry from race engineer to a tactical coordinating role in the team. Team Principal, Ron Dennis revealed, "We have analysed every single lap from every single race last season and we have learned from them and we are ready for the challenge ahead." Team Principal: Sir Frank Williams; Technical Director: Patrick Head; Chief Designer: Gavin Fisher. Chassis: Williams FW23; Engine: BMW; Tyres: Michelin. Goal for the 2001 season: Team principal Frank Williams stated that, "I want us to finish every race, have great pit work and good race strategy and maybe win a race or two � if the red and silver cars make a mistake." BMW's Motorsport director, Gerhard Berger elaborated: "It is highly unlikely that we will be able to completely close the gap with the established front-runners in our second season with Williams, but we want to improve our performance so as to be ready and waiting to pounce as soon as one of the Ferraris or McLarens run into problems." Technical Director Patrick Head added, "We hope that this car and engine will permit our drivers to challenge for race wins in 2001." Modifications for 2001: Chief Aerodynamicist Geoff Willis said that, "The FW23 is, in concept, an evolution of the FW22 with developments and improvements for the new engine installation and gearbox and a large number of changes reflecting the impact of the new regulations." BMW Motorsport Director, Mario Theissen, added: "The new smaller and lighter engine from BMW will assist with the chassis dynamics as well as providing greater power." Greatest assets: Experience, perseverance and a track record of success. A stable design team. Achilles Heel: Poor race strategy has lost Williams several races in the past. Team Principal: Flavio Briatore; Technical Director: Mike Gascoyne; Chief Designer, Tim Densham. Chassis: Benetton B201; Engine: Renault; Tyres: Michelin. Goal for the 2001 season: Team Principal, Flavio Briatore, stated that "Winning the championship in 2001 is not our goal. Our goal is to put the right people with the right tools into a development programme in place for the future." Renault Sport's President, Patrick Faure, added, "This year is one of transition and adjustment for us and we plan to strengthen the team and test a lot of new ideas. We want to make a great technological leap forward in terms of compactness, weight, and efficiency." Modifications for 2001: Briatore explained, "We decided in the end to start with a new engine. Sure it was much more sensible with the old one, but if you start with the old one you never develop properly the new one. If you want to take the risk, like I tell you before, new engine and new tyres, then it's exactly the year we need to do this." The new Renault engine is a radical 111° V10, which should have a lower the centre of gravity than the conventional 72° V10 engines. Greatest Assets: The resources of Renault - the company that pioneered the 3 Litre V10 engine. Achilles Heel: The team is still in transition, and the B201 has been neither fast nor reliable in winter testing. Team Principal: Craig Pollock; Technical Director: Malcolm Oastler; Chief Designer: Adrian Reynard. Chassis: BAR 003; Engine: Honda RA001E; Tyres: Bridgestone. Goal for the 2001 season: Team Principal Craig Pollock stated that, "Our aim in 2001 has to be at least a third place finish overall and to win some races - and with the team and infrastructure we now have in place, that is achievable and that is what I want." Jacques Villeneuve echoed this sentiments, saying: "Third place is the minimum acceptable for us to be happy, I would say. Hopefully, we will reach it because else it will be a big weight for all of us to carry." Modifications for 2001: Technical Director Malcolm Oastler stated, "We are very pleased with the 2001 car. It has met all of the objectives that we set ourselves in the design brief last year." Oastler added, "There have been some significant rule changes for this year and we are happy with our progression and the fact that we have been able to meet all of the necessary requirements. We have made a saving of around 30 kilos on the weight of the car and have already exceeded our original aerodynamics targets. It has been a very intensive programme and the team has done a really good job. We feel we are in good shape and looking forward to the season ahead." Greatest Assets: Good resources, a partnership with Honda and two good experienced drivers. Achilles Heel: Inexperience and infighting within the BAR team. Team Principal: Eddie Jordan; Technical Director: Eghbal Hamidy; Chief Designer: John McQuilliam. Chassis: Jordan EJ11; Engine: Honda RA001E; Tyres: Bridgestone. 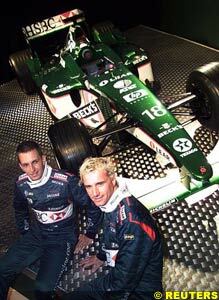 Goal for the 2001 season: Eddie Jordan stated, "We have learnt lessons from last year and we know we made mistakes. We are going to work harder than ever to put them right but we will still have fun." 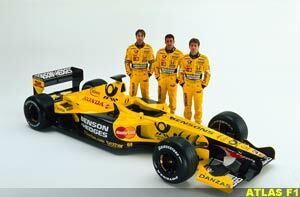 Heinz-Harald Frentzen added, "Our goal is to continue where we finished off in 1999." Modifications for 2001: Frentzen stated, "When we get the car reliable, there's no reason to think we can't be successful again. Hopefully we've improved the car in all areas � the engine, the mechanicals and in the wind-tunnel � and hopefully we can attack right from the beginning." Greatest assets: Patience, steady progress and "people-smartness" has produced a stable, reliable and consistent team. Generally, their race strategies are sound. Jordan are now using a works Honda engine. Achilles heel: Jordan are regrouping after a disappointing 2000 season and the loss of their technical director, Mike Gascoyne. Team Principal: Tom Walkinshaw; Technical Director: Mike Coughlan; Chief Designer: Nicolo Petrucci. Chassis: Arrows A22; Engine: Asiatech; Tyres: Bridgestone. Goal for the 2001 season: Team Principal Tom Walkinshaw stated that the team were looking for reliability rather than immediate performance from the Asiatech power unit, and by the 2002 season Asiatech will have developed a completely new engine for Arrows to use. Walkinshaw revealed, "My target is the top five or six, if we finish there we'll have done a good job." Modifications for 2001: Arrows driver Jos Verstappen revealed, "The new car is very similar to last year's. We still need to work on its set-up but most of the problems have been worked out and we are looking good for Australia." The front suspension is rumoured to be changed from a pullrod to a more conventional pushrod system. Greatest Assets: Last year's A21 was fast and handled well in the wet. Furthermore, Arrows now have the exclusive use of a state-of-the-art wind tunnel in Bedford, England. Achilles Heel: The Asiatech engine is based on the promising but technically flawed Peugeot A20 V10 engine. It remains to be seen how reliable the Asiatech engine will be. Furthermore, Arrows have lost chief designer Eghbal Hamidy and have dispensed with the services of the talented Pedro de la Rosa. 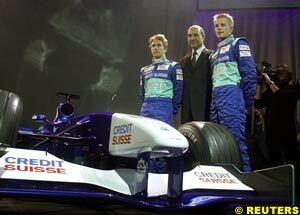 Team Principal: Peter Sauber; Technical Director: Willy Rampf; Chief Designer: Steven Taylor. Chassis: Sauber C20; Engine: Petronas 01A (Ferrari 049); Tyres: Bridgestone. Goal for the 2001 season: Team Principal Peter Sauber stated, "We want to get away from the eighth position in the constructors' standings and for that you need a good car and good drivers." Modifications for 2001: Chief aerodynamicist, Seamus Mullarkey, stated: "The revised technical regulations forced us to completely rethink our aerodynamic package. What you see on the C20 will change as the car develops further through the season. Aerodynamic research is an area of Formula One car design which never ceases." Technical director Willy Rampf added: "Reduced weight will allow us to run more ballast and to position it in a wider range of locations. This will be particularly important in 2001 as the arrival of Michelin as a challenger to Bridgestone will spark serious tyre competition." Greatest Assets: Sauber is, overall, a well-run team. The C20 has been fast during winter testing and the Ferrari engine is both fast and reliable. Team Principal: Bobby Rahal; Technical Director: Steve Nichols; Chief Designer: John Russell. Chassis: Jaguar R2; Engine: Cosworth CR3; Tyres: Michelin. Goal for the 2001 season: Team principal Bobby Rahal stated, "Our aim this year is to achieve respectability and to continue to put in place the building blocks that we believe will deliver success in the long term. We are unswerving in our ultimate goal which remains to challenge for World Championship honours." Greatest assets: Ford's financial muscle should give Jaguar the resources to introduce new developments quickly. Achilles heel: Jaguar were in disarray in 2000, and although Jaguar have recruited talented individuals, whether they will gel to make a successful team remains to be seen. Furthermore, the Jaguar R2 has not been competitive in winter testing. 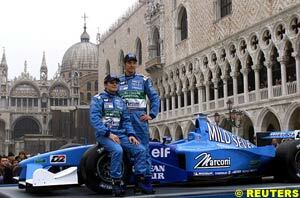 Team Principals: Paul Stoddart and Gian Carlo Minardi. Chassis: Minardi M03; Engine: Cosworth; Tyres: Michelin. 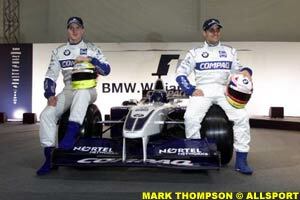 Goal for the 2001 season: Team Principal, Paul Stoddart, declared that "We have a five-year plan that is set in stone. In year one we want to summarise, stabilise, and rebuild, and in the next we will get an engine partner and climb up the field. In years three and four we will be in midfield, and hopefully get a works engine deal, and in year five we want to be regularly qualifying and finishing in the top-10." Greatest Assets: Commitment. Last year's Minardi M02 was a sound chassis. Achilles Heel: The team had no winter testing at all. Once again, limited funding and resources, an outdated engine and inexperienced drivers. Minardi is a similar position to the Tyrrell team in 1998, having been taken over after a long history in Formula One. The Minardi team has been on life-support over the winter and is in serious but stable condition. Team Principal: Alain Prost; Technical Director: Henri Durand. Chassis: Prost AP04; Engine: Ferrari 049; Tyres: Michelin. Goal for the 2001 season: Team Principal, Alain Prost, stated, "In the early races, when other teams will have problems with their new cars, it is necessary for our goal to be to collect precious points. That is our aim." The Frenchman added: "We want to gradually progress in the level of performances and for this we have planned one series of developments." Modifications for 2001: "The car that we will have in the first race will have various aerodynamic and technical changes," Prost revealed. "Then from the fourth race of the season you will see new developments." Greatest Assets: Prost now has the fast and reliable Ferrari engines. The Prost AP04 has been quite fast in winter testing. Achilles Heel: Prost ended last season in technical and financial disarray. The 2001 season may be the first step forward for the team.